Tyler and Perry together again...but for how long? Steven Tyler surprised Joe Perry on stage last night (10 November) to tell him - and a NYC concert audience - that he was not leaving Aerosmith. And with that, the band broke into the Aerosmith classic Walk This Way. Joe Perry Project singer Hagen graciously stepped back for Tyler to handle lead vocals, although he soon joined in on the choruses and call-and-response parts. 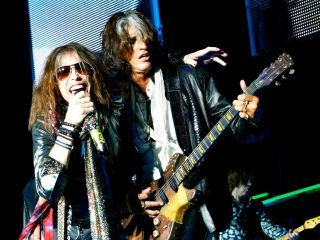 It was only two days ago that MusicRadar reported on what seemed like a definite split in the Aerosmith camp, with Joe Perry saying, "Steven quit as far as I can tell" and that the band would "probably find somebody else that will sing." The tale of this veteran group keeps getting weirder. If they could just put half of their recent drama into the lyrics of a new record...now, there's a thought!